Michal Kwiatkowski has become the first Polish road cycling world champion having held off a charging chase in Ponferrada, Spain to win gold in the elite men’s event today. 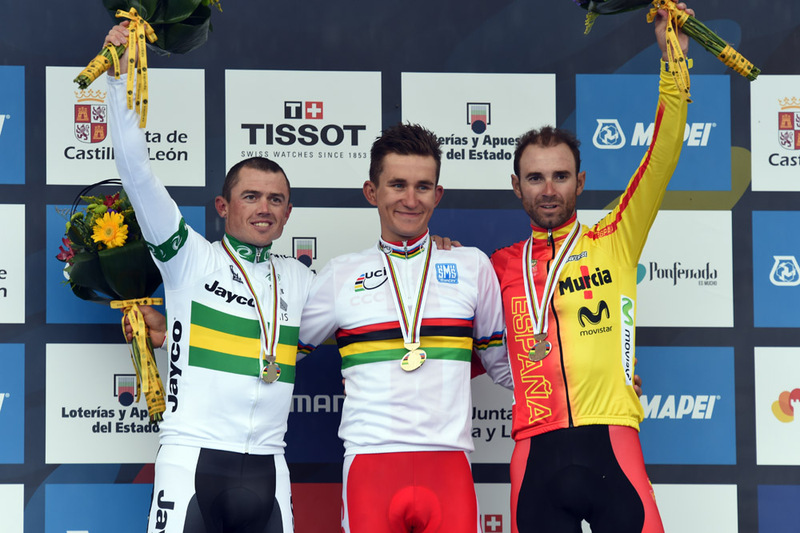 Kwiatkowski celebrated a narrow victory over Simon Gerrans (Australia) and Alejandro Valverde (Spain) in what was a gutsy display from the 24-year-old and his national team that used all of its resources quite early in the 254.8km race that comprised 14 laps of an undulating 18.2km circuit. Kwiatkowski, who entered the titles on the back of the second-place finish at the Tour of Britain, attacked on the descent of the second last climb and did not look back, powering past the remnants of an escape within the last 10km. The beginning of the championship was largely uneventful with a four-man break including Zydrunas Savickas (Lithuania), Matija Kvasina (Croatia), Carlos Julian Quintero (Colombia) and Oleksandr Polivoda (Ukraine) allowed a gap in excess of 14-minutes. Poland controlled the race alone, which provoked some experts to question its tactics when Kwiatkowski, still with 70km remaining was left with just two, from eight, team-mates in Michal Golas and Pawl Poljanski. The first reshuffle of the race came around then when Italy started to contribute to the chase and the break was reeled in. British national champion Peter Kennaugh, Giovanni Visconti (Italy) and Chris Juul Jensen (Denmark) moved off the front thereafter with Tony Martin (Germany) bridging to what became a group of 13 riders. Martin, with team-mate Simon Geschke also in the break, rode off the front but later returned when no one chased. It was a smart tactic from the Germans, who could leave designated sprinter John Degenkolb sitting comfortably in the main group. Kennaugh appeared frustrated by the lack of co-operation as Australia assembled at the front of the peloton and picked up the pace having missed the move. The Manxman and Visconti were the last to be caught with 30km remaining as Spain moved to the front of affairs for the first time. Alessandro De Marchi (Italy), Cyril Gautier (France) and Michael Valgren Andersen (Denmark) pulled away not long after the race had regrouped and, with no concerted chase from the reduced peloton, established a small time advantage inside the final 25km. Vasil Kiryienka (Belarus) bridged to the leaders who stayed away until the last lap where all the main favourites, including sprinters and opportunists, were still in contention. A chase group of six including Gerrans, Valverde and former world champion Philippe Gilbert (Belgium) accelerated on the final climb however the chasing peloton behind it was still in camera shot on the home straight where Kwiatkowski took a brief moment to turn around and look before raising his arms over the finish line. Vincenzo Nibali (Italy) crashed earlier in the piece but it was an accident involving Norway and Croatia team cars that comprised the most concerning incident of the day. Staff from both teams were transported to hospital with reported broken bones after a car crash in the race convoy.